Spectra has enhanced speed and strength, and she can fly. Her mind emits a psionic shield around her body allowing her to withstand concussive blows and energy blasts, while also allowing her to exist in harsh environments such as deep space. She also has telepathic and telekinetic powers. 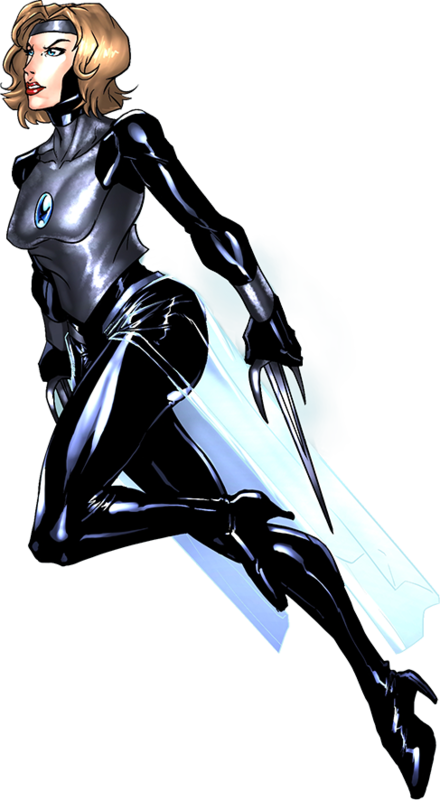 She carries a set of sai blades as her primary physical weapon. Spectra is a powerful superhero from Super Earth One, a planet in the Infiniverse alternate reality that was discovered by 22nd Century scientist Dr. Jessica Beck and her expedition team when they attempted to travel back in time. The 97 member team became stranded on this planet and thus worked to build a new society that eventually thrived for a long era despite a major war that saw all normal humans wiped out by the hyper-beings of the planet, and a subsequent conflict called the War for Eternity that was prophesied to eventually end with the destruction of Super Earth One and the Infiniverse as a whole. After the Hyper-Human War, Spectra became a major player in the War for Eternity as she joined the Infinity Force, lead by Michael Xander Hope aka Captain Infinity, against Madam Zero and the Army of Shadows. She was a mighty and powerful warrior as she assisted in battles against some of the most dangerous entities, including the dastardly and villainous War Chess and his vicious cloned cohorts, Madam Infinity and Captain Zero. Some time after the Hyper-Human War Spectra, along with Captain infinity, Max Galaxy and Decibel, took on the dangerous task of flying to Marz Zeta and stopping War Chess from launching a battery of nuclear bombs at Super Earth One. They defeated the villains and were able to send War Chess into deep space while completely destroying Captain Zero and Madam Infinity, thus sending them to the Shadow Realm for the rest of existence. A little while later, while searching the Shadow Forest, Spectra, Max Galaxy and Decibel were the first to confront the new and more powerful Madam Zero. The villain got the jump on the heroes and kidnapped the three of them. She then proceeded to infect them with a portion of her darklight energy, thereby gaining control of their actions. She then sent them to attack the Infinity Fortress. They were eventually defeated and held prisoner until the darklight energy was purged from their bodies. After that brush with the darkside, Spectra dedicated herself to training and disciplining her body and her mind. She was already a powerful hero, but she had become wary that her mind was too vulnerable. Through several months of meditation and concentration she was able to unlock a hyper-ability that had laid dormant – telepathy. This made her a uniquely qualified hero, for despite the fact Super Earth One was filled with exclusively hyper-beings, she was one of a very few who had natural psionic abilities. And of those few, she was by far the most powerful. Furthermore, her resolve to carry out the purpose of the Infinity Force was stronger than ever. It was their job to convince as many hyper-beings as possible to dedicate their life and give their allegiance to The Light, for all of those that did would escape the doomed fate of Super Earth One, and instead be transported to a new world at the conclusion of the War for Eternity. Madam Zero opposed the idea of watching the world be destroyed and she brought people into the Army of Shadows by telling them that hypers should work together to save Super Earth One. Spectra and Madam Zero clashed on many occasions. Spectra also clashed with Captain Infinity’s sister Centuria as well. Despite being dedicated to The Light, Centuria’s violent tendencies toward hypers who were undecided about which path to follow irked Spectra. She had many arguments with Centuria, even using her telepathy at times to probe her thoughts. But for a long time, the two of them could just never get on the same page. Eventually they agreed to disagree and tried to give each other space. That turned out to be quite easy as Spectra – one of the few hypers-humans who could withstand the harsh environments of deep space – was tasked with patrolling the planet’s perimeter. On several occasions she protected Super Earth One from giant meteors, alien space creatures and astronomical phenomena that those on the surface never even knew about. When the Eternity Key appeared on Super Earth One it was a sign the War For Eternity was coming to an end and thus the infiniverse was soon to be no more. As the time to use the key neared, a mysterious humanoid entity called Seven arrived on the planet with the task of ushering all followers of The Light through a doorway that would be created by the Eternity Key, allowing them all to migrate to the new world. Eclipse, Sapphire Shade and Fracture of the Centurians, however, obtained the key and used it prematurely, causing a door to the Shadow Realm to open and the villainous Madam Infinity and Captain Zero the opportunity to wreak havoc on both the Infinity Force and The Army of Shadows, going so far as to transport a huge number of powerful hypers to the Shadow Realm. Spectra flew back to the planet’s surface, traveled into the Shadow Realm, found Captain Infinity and the other members of the Infinity Force and brought them back to Super Earth One. But at they returned, they found the planet in chaos as the Infiniverse Timeline was in the final stages of its collision course with the Core Reality Timeline. Super Earth One was beginning to crumble. Seven, who had stayed on Super Earth One during Spectra’s mission into the Shadow Realm, took the Eternity Key and handed it to Captain Infinity, signifying that he must fly high above Super Earth One and use the Key to open the portal to the new world. After his brutal confrontations with Captain Zero and Madam Infinity however, he was still recovering and unable to complete the task. He turned to Spectra and handed her the Key – she was the only one with enough power to do it. She hesitated for a moment, but then a massive earthquake shook the ground, as the planet began to crack in many places. Harsh winds blew as Super Earth One was literally spinning into Oblivion. Spectra grabbed the Key and prepared to take off for the sky. She was stopped however by Centuria. The leader of the Centurians held out her Infinity Rings, then motioned to Captain Infinity to give her his Infinity Sabre, suggesting that Spectra may need to use the Chronicle Wave to save the day. Captain Infinity agreed and Spectra was armed with the two powerful weapons as she flew high above Super Earth One. She looked down for a moment at the planet that she had grown up on and called home, and how it was falling apart. She turned and looked out into space, and saw the entire Infiniverse converging inward. She could feel the metaphysical pressure of everything coming to an end and the she could feel the fear and hear the panic of every individual on the planet. It was time. She held the key up and unleashed its power, causing a massive portal in the sky to open up! Within seconds, the members of the Infinity Force and all others who had chosen to follow The Light began to ascend into the sky. It was a beautiful sight as hundreds of hyper-beings floated up and passed her on their way to salvation. After a few minutes, the final hyper-humans, Captain Infinity and Centuria, rose up toward the portal. Captain Infinity gave her a nod of approval then flew threw the portal with his sister. The Captain found himself in space looking down on the Planet Earth – a place he had seen in his visions and heard about through prophecy. He exhaled – the War for Eternity was finally over. He turned back to take one last glimpse of Super Earth One and see the portal close – but when he looked, he saw something else – Spectra had NOT come through the doorway. And for all intents and purposes it looked like she wasn’t going to. Captain Infinity yelled for her to come through, but she refused. She then asked the Captain to look at Super Earth One – there were still dozens, maybe hundreds of hypers standing on the surface of the crumbling planet. He said to her that it was too late for them; that they can’t be saved. She responded that she must try, that they must be given every chance possible to turn away from the shadows and make a decision to follow The Light. The Leader of the Infinity Force told her there was not enough time. Spectra then announced that she would “make time.” And with that she brought the Infinity Rings and the Infinity Sabre together and unleashed a Chronicle Wave! A massive shockwave rocked the entire universe and an incredible burst of light blinded Captain Infinity for several minutes. When he was finally able to regain his sight and his bearings, the portal doorway had closed. There was no sign of Super Earth One; No sign of the Infinity Sabre or the Infinity Rings; No sign of the Infiniverse.